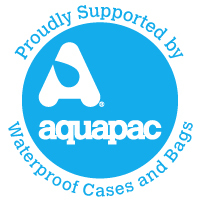 British manufacturer of waterproof cases and bags, Aquapac, has continued to support the team by providing individual members – who have to pay for their own kit – with a substantial discount, as well as providing the team with a range of cases for central equipment. It’s small-scale sponsorship deals like this that allow the charity to continue to be operational. We are not always on the lookout for large sponsors, but donations of individual pieces of kit, or discounts for members all add up to letting us be sustainable.